Starting in September more three-year-olds will be enrolled in free, full-day public school. The Department of Education will offer roughly 20,000 3-K seats across 14 community school districts by 2020. Unlike the rapid rollout of universal pre-k, the city has adopted a more measured pace for 3-K, focusing first on neighborhoods with high concentrations of poverty and then expanding out from there. Over the past two years, the city established 3-K programs in neighborhoods such as East Harlem and Harlem in Manhattan, Bedford-Stuyvesant and Ocean Hill-Brownsville in Brooklyn, and parts of the South Bronx and South East Queens. It’s free, full-day preschool for three-year-olds that follows the same school day and calendar as pre-k (for four-year-olds): 6 hours, 20 minutes each day for 180 days. Each 3-K class is lead by two adults and no more than 15 children who do not have to be toilet trained to attend. Any child born in 2016 is eligible to attend 3-K in September 2019, though there are not nearly enough seats to accommodate all three-year-olds in the city. Programs will be offered in a range of settings including some public elementary schools that offer preschool (3-K and pre-K) as well as grades kindergarten and above; pre-k centers, which are sites that only serve students in 3-K and pre-K; and early child care centers, which are independent organizations that contract with city to offer free 3-K and pre-k. 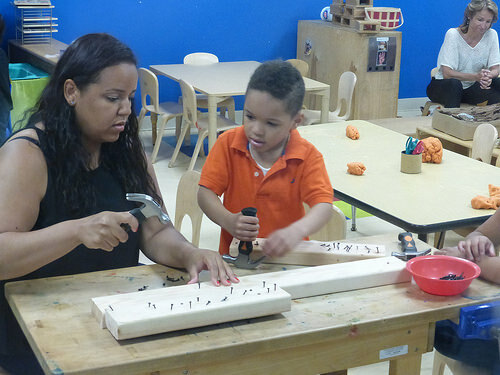 Learn more about 3-K and pre-k enrollment and options in our preschool parent guides. As the city expands 3-K in the coming years, it will need to find more space, which is particularly challenging in neighborhoods where elementary schools are overcrowded and child care centers are scarce. As part of its 3-K expansion, the city is planning to open programs in family child care settings, which are small child care businesses run out of private homes that serve children ages 0 to 4. Read more about the city’s plan, including the potential benefits and challenges of offering family child care-based 3-K, in a new report by our colleagues at the Center for New York City Affairs.